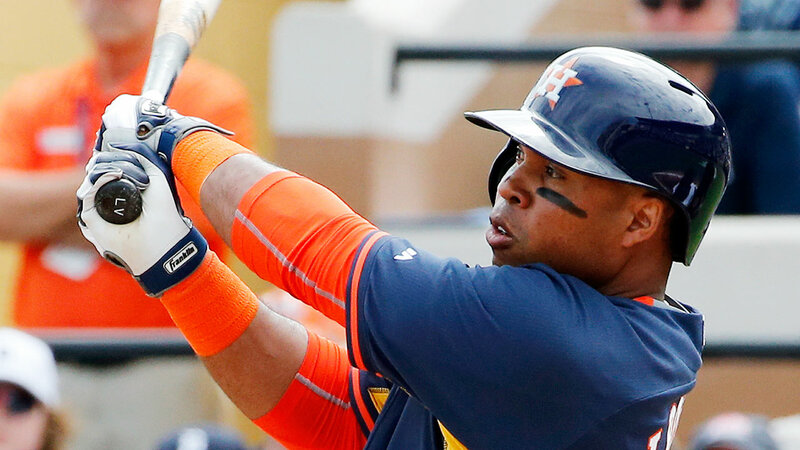 Luis Valbuena had a solid season with some potentially confusing results. He began the season as the Houston Astros primary third baseman after several seasons as a sort of super-utility player for the Cleveland Indians and Chicago Cubs. In 2014, Valbuena showed signs of a power breakout by batting .249/.341/.435 with 16 homers in 478 at-bats. Well, the power certainly came on as Valbuena had slammed 25 homers going into the last day of the season. He hit 19 of those homers in the first half but with a disappointing boom or bust slash of 199/.285/.430 that limited his value to fantasy owners even in this low batting average era. It was enough to return him to a more limited role in the second half of the season, as he entered a platoon of sorts with Jed Lowrie and made the odd appearance at second or first base. He did bring his batting average up, he finished at .224/.311/.441 by batting .273/.364/.462 in his last 143 at-bats. Valbuena would be eligible for free-agency after the 2016 season and is unlikely to be re-signed as a starter. There are not any standout third basemen in free agency this year. It seems unlikely that the Astros will make a free agent addition. The Astros do have some very interesting prospects that could play a role in 2016. The most familiar name is probably Colin Moran who came to the Astros via a trade in 2014 and has done nothing but hit since. Moran's first half was largely ruined by a fractured jaw suffered by an errant throw in May. He made up for the slow start with a blistering second half of the season in which he batted .333/.416/.526 and earned a promotion to Triple-A. GM Jeff Luhnow is a big fan of Moran - trading for him after seriously considering him with the first overall pick in 2013. Moran probably hits for a solid or better average in the majors but has not yet developed the power most managers like to see at the position. Less well known but moving up prospect charts with a bullet is Tyler White. White was a 33rd round pick out of Western Carolina University. He has hit at every level and has more in-game power than Moran. He is not yet on the 40-man roster but is certain to be added after this season. He hit a combined 325/.442/.496 with 84 walks and 73 strikeouts on the season along with 25 doubles, 14 homeruns and 99 RBI. He is seen by many as a future first baseman but has played more at third base than first to this point. His bat looks extremely potent and there should be more power coming. J.D. Davis is even less well known than White but he has the best right-now power of this trio of prospects. This season he hit .280/.370/.520 with 28 doubles, three triples, 26 home runs and 101 RBI in 120 games. He was a college first baseman and pitcher and has a plsu arm at third but is still learning some of the nuances of the position. He is the furthest away from the majors as things stand but if his glove continues to improve and he develops into a solid third baseman he could be at the top of this list in going into the 2017 season. The guess here is that Jed Lowrie and Luis Valbuena will be the favorite going into Spring Training to renew their platooon at the position. But I expect Tyler White to make a lot of noise in the spring and either he and Moran could complicate things going into the 2016 season. All things being equal, Moran probably gets the first real opportunity due to his draft pedigree but White probably has the most impact bat.